If there’s one gripe I’ve had about our halal culinary scene in Singapore, it’s that there is no single place that is dedicated purely to pancakes. The two pancake houses in Singapore that I’ve heard of, namely Strictly Pancakes and Paddington House of Pancakes, unfortunately, are not halal-friendly. Thus, when I heard about the one-month-old Sarah’s the Pancake Cafe, it got me so excited that I was willing to make the commute from the North to the East. I managed to rope in a few of my colleagues for this review so that we could try more dishes. Just like me, my Muslim colleagues were just as excited as the prospect of a halal pancake house here in Singapore. 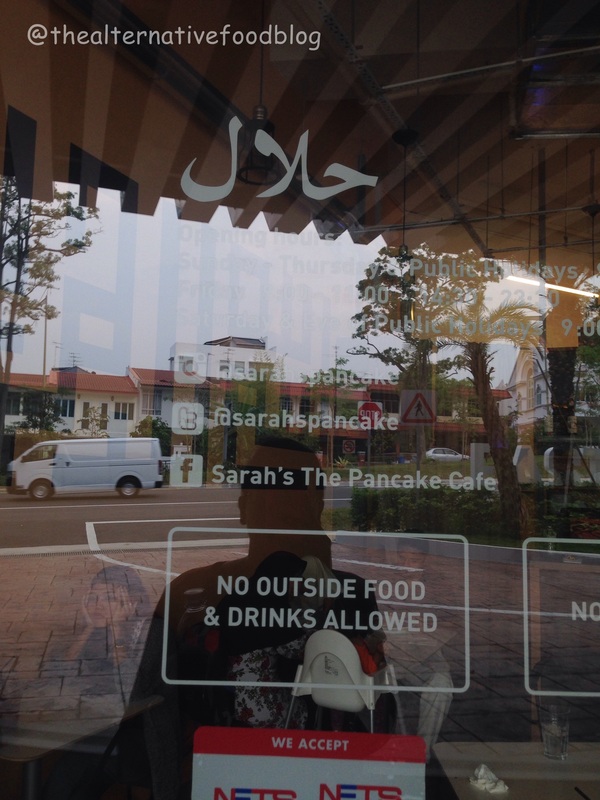 For those who are familiar with Simpang Bedok, you’ll find Sarah’s the Pancake Cafe easily since it’s located at East Village, just directly behind the open-air carpark that is closest to Tang Tea House. Thankfully, my colleagues and I had made our way down relatively early in the afternoon so parking wasn’t too difficult for us. However, I later learned that East Village also has a basement carpark so perhaps, parking wouldn’t have been that much of a problem. Admittedly, when we arrived, I was rather shocked to find that the cafe was quite small in size. Based on my estimation, it would possibly seat a maximum of thirty people. I arrived with a group of five people and a small baby and the staff were kind enough to rearrange some tables to accommodate us. My suggestion if you’re travelling in groups bigger than four is to call in advance and ask if you can make a reservation or if they are very crowded. After all, the last thing you’d want after travelling to the East for your pancakes is not being able to sit and enjoy your meal. Between the five of us, we shared a few MJ’s (SGD $14) , the El Mexicano Choc Crepes (SGD $12.50) , a Morning Run (SGD $12) , as well as an order of shoestring fries (SGD $4.50). Given the filling nature of pancakes, we opted for mineral water instead of flavoured drinks this time. The order process is quite simple – head over to the counter, place your order, make your payment and then, head back to your seats for your meals to be served to you. Our orders didn’t take too long to arrive and what I appreciated was the care taken to prepare and present each plate nicely. All the various elements on the plate were carefully arranged to create a visually beautiful plate of food. Since my colleagues were all ordering pancakes, I decided to try their El Mexicano Choc Crepes. My order of crepes arrived and looked as pretty as a picture with an array of colours filling up my plate – white, pink, green all wonderfully scattered on my plate. 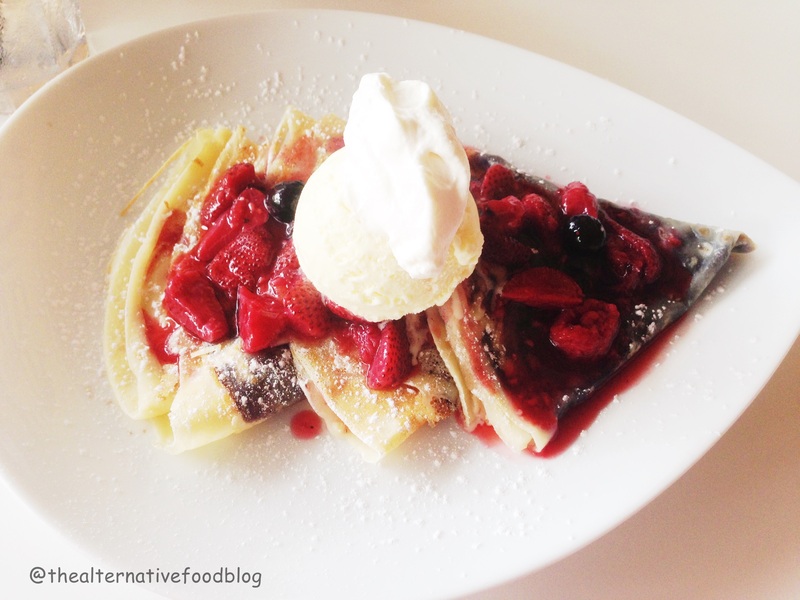 My serving of crepes consisted of three crepes that was served with their Mexican Chocolate ganache, berries compote, whipped cream, ice cream and a dusting of icing sugar. I enjoyed my crepes because they were light and it didn’t fill me up too quickly. There was also a nice balance of sweet and tangy elements on my plate, which meant that I didn’t get too sick of my dish so quickly. I thought that this dish was a rather smart dish because it wasn’t cloying and it didn’t fill me up too quickly and actually left me wanting to try something else. 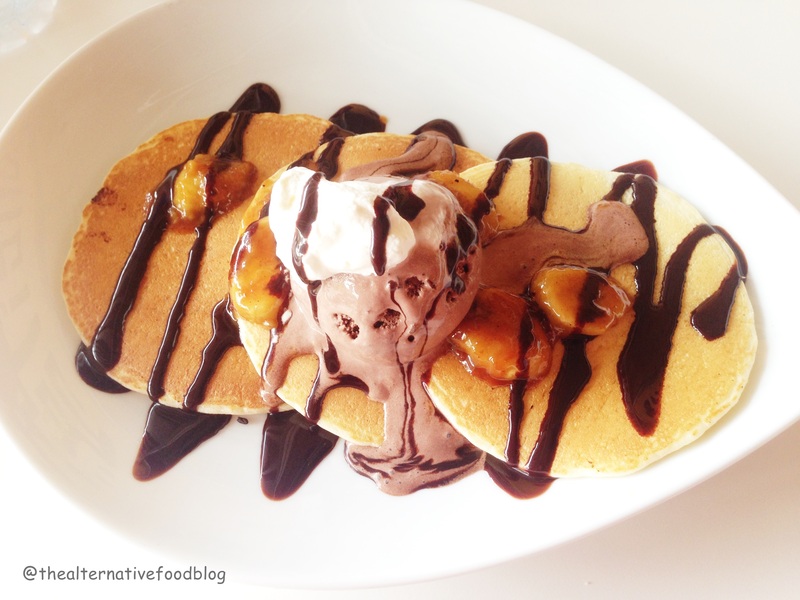 We also ordered the MJ, which is a white and dark chocolate chip pancake that comes with caramalised banana, a scoop of chocolate ice cream and with a showering of chocolate sauce and whipped cream. The MJ, on paper, sounded like a chocolate lovers dream so a few of my colleagues ordered this because they were so intrigued by the combination of sweet elements on the plate: sauce, ice cream, chips and caramalised banana! Across the board, we all felt that this dish was probably a really heavy dish and one too many sweet elements that made us full really quickly. However, one of my colleagues did mention that the ice cream was a smart addition to the dish because it served as a sauce for the pancakes and added that extra bit of moisture that we felt the pancakes required. Pancakes, like cupcakes, cakes and waffles, are all very dependant on each individual preference. Some people like their pancakes light and fluffy while others like them thicker and denser. The five of us tried the pancakes on two of their dishes and felt that overall, their pancakes were of the light and fluffy variety but lacked that extra oomph that we were hoping a pancake house would bring to a common breakfast favourite. The pancakes reminded me a lot of McDonald’s hotcakes in terms of the general texture, shape and size but, unfortunately, wasn’t as fluffy. However, like I said earlier, it’s all dependent on your personal preference and what you look out for in a pancake. 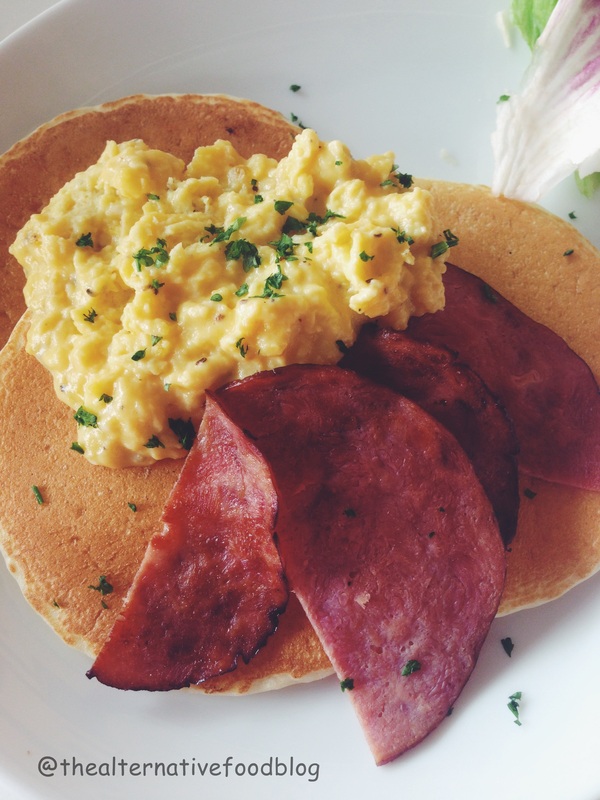 The final pancake we tried was the Morning Run which is a savoury pancake dish which consists of three pancakes served with a side of scrambled eggs and turkey bacon. When the dish first arrived at our table, we could hear the sizzling of the freshly scrambled eggs and could see the steam rising from the hot eggs, which got everyone a little excited. My colleague thought that the pancakes were all right and shared the same sentiments as the rest who had pancakes too i.e. not fluffy. 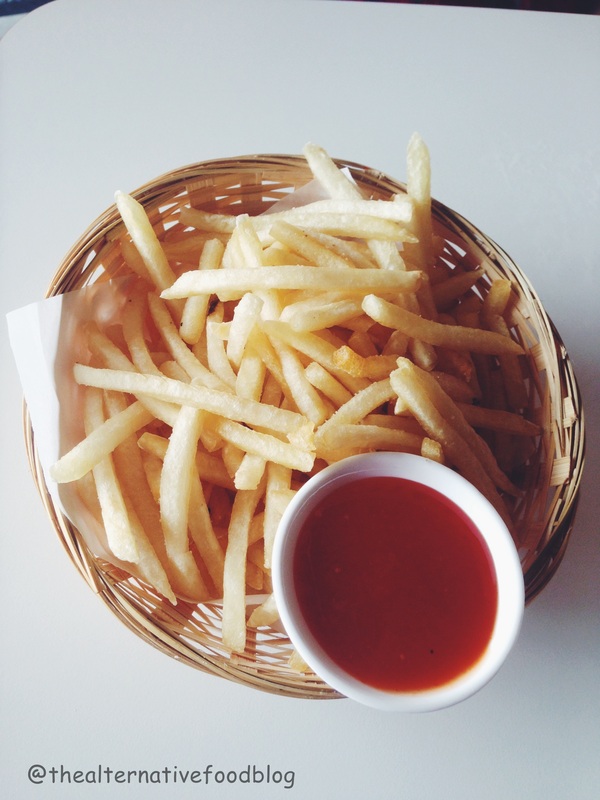 Strangely though, even though we travelled all the way for pancakes, the dish that left a lasting impression on us was the shoestring fries which were fried to golden crispiness, were seasoned well with salt and served hot with a side of chilli sauce. My colleague commented that the fries were extremely tasty and reminded her of home-styled french fries, the ones that you probably grew up on at home when you were younger. Half way through our meal, one of my colleagues felt her eyes smarting. At first, she didn’t mention it but it was only after a different colleague commented that her eyes were rather watery that we make the connection to the ventilation in the cafe. Since the cafe is not an open-air one, the fumes from the kitchen can actually make its way out and this unfortunately could lead to patrons experiencing some eye irritation. While at their Facebook page doing some fact checking, I noticed that this is a problem faced by a few other patrons too and unfortunately, the downside of sitting indoors in a small space with an indoor kitchen is of course, smelling like food. I can’t seem to put my finger on what I felt was really missing from my whole experience at Sarah’s the Pancake Cafe. I mean, don’t get me wrong – there was nothing particularly wrong or bad about our dining experience there but like their motto, I feel that they could do batter. How to get there: Nearest MRT stations: Tanah Merah followed by a bus trip (Bus No. 2 or 9) and alight at only the second bus stop! Buses available – 2, 9, 10 and 48. Halal Status: Muslim-Owned eating establishment. I should come here with my friends one day!